Thousands of garment workers who make clothes for global brands have taken strike action over low wages. It is time the Western consumer listened. The head of the Bangladesh Garment Manufacturers Exporters Association also demanded that workers go back to work this week, otherwise they will not be paid and factories will be shut down. Although some workers have gone back, a simmering discontent remains. Prime Minister Sheikh Hasina’s government claims the recent parliamentary victory of her party, the Awami League, was due to its success with development policies that ordinary people supported. This is partially true. Under her rule for the last 10 years, economic growth has grown steadily and was at 6 percent in 2018 with the garment sector providing a key source of revenue. But growth is not equal to distribution of wealth, and while a majority of Bangladeshis are no longer dying of hunger as they did in the 1970s and 1980s, many of them remain unemployed and malnourished. But how much of this economic growth has trickled down to the garment workers whose labor brings $30 billion a year into the national exchequer? Garment workers form a critical workforce for the economic growth of the country and yet they remain the most neglected by the state when it comes to their right to a living wage. These young women, between the ages of 15 and 45, spend the best years of their lives stitching clothes for global retailers such as H&M, Zara, and Carrefour. By the time they exit factory work, their bodies are broken, their eyesight weakened, and many have severe upper-respiratory problems. Because of very low wages and high cost of living, most of the workers have very little in savings to tide them over in retirement. Between 2013, the year of the Rana Plaza industrial crisis that killed over 1,100 workers, and 2018, workers made an abysmal income of $53. This rise in wages to $53 from the previous worldwide low of $30 was matched by factory owners doubling their production expectations from 60 to 120 pieces per worker. If the workers could not finish their allocation on time, they were called lazy, and made to work without overtime to meet their daily quota. 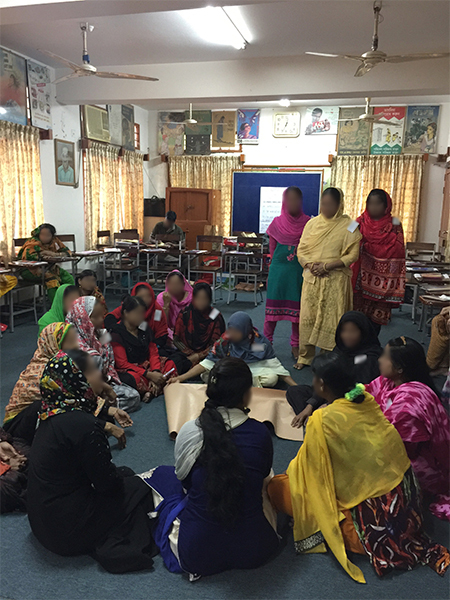 Workers’ inability to find affordable housing in the densely populated areas around Dhaka city, combined with the rising cost of food, education for their children, and health care, have pushed these young women to precarious conditions. Compared to workers from 20 years ago, the young cadre of workers today tend to have higher levels of education, and with it, aspirations for a better life. They are more informed than a generation ago, and they are motivated to achieve objectives through direct action politics. When wages are illegally withheld, workers take to the streets to demonstrate. Their rapid mobilization and occupation of the already traffic-clogged streets in and out of Dhaka city, the country’s economic and political nerve center, is a strategic but a risky move. Police are immediately brought in to move them out of the streets. They are tear-gassed, beaten with batons, fired upon, and arrested. Factory owners use CCTV images to identify workers who participate in these strikes, and they are later fired from work. Unchecked violence against unarmed workers has become the norm in this industry. While trade unions were never banned in the garment industry, the government and factory owners made it very difficult for trade union leaders to recruit workers. Many trade union leaders also work in the interests of the government and owners over the interests of workers. Thus, one has to be remarkably impressed by the garment workers who take to the streets despite draconian attempts to derail their struggle for wages. What should not be missed is that the Bangladeshi garment workers are speaking up. They are speaking not only to the factory owners, the state, and the global retailers, but to the global consumer. The demand for workers’ rights must come from the Western consumer. The consumer must force the global retailers to lower their profits and demand higher wages for the workers. Lamia Karim is an associate professor of anthropology at the University of Oregon specializing in women and development in Bangladesh and South Asia. She is currently working on a book on garment workers in Bangladesh.